Bless my wife’s heart for her support and willingness to accept me giving up a real paycheck and being way less available. But I think the venture has merit and potential, we’re moving in the right direction, and I really hope we can make it work over time so that it’s a stable, even if very modest, source of income and a meaningful business that has a positive impact on the sport and its participants and fans. What has been your favorite article? Yee: Oh man, there have quite a few. Once I get over the incredible fear of opening the mag just after it ships, I’ll inevitably open it to refresh my memory on the contents or look up a certain article and then find myself just sitting there and reading it. And quite often I catch myself 30 minutes later enjoying re-reading the articles as a reader and not as a publisher. Of course I see all its imperfections, but it’s nice that as a ‘cross fan I really do enjoy reading the different pieces contributed by the community. I probably can’t choose just one, but I’ve really enjoyed reading Vardaros’ interviews of some of the top starts like Boom, Nys, and Vos as well as the interviews we’ve done with top domestic pros like Compton, Page, and Johnson. I always learn something new from these racers at the top of the sport. But a few others that I’m fond of are the articles we had on cultural things like sandbagging, heckling and singlespeeding, and think that our history piece, national champion interviews, tire reviews and tire pressure research were comprehensive and innovative. Our next issue, Issue 7 has a very good story by Christopher Bagg on Alison Dunlap who’s returning to racing this year, and a great interview with World Champ Niels Albert. I work on a publication that once ran a story about a U.S. Corps of Engineers river project. The headline read something like “Corps Defends Cost Overruns on Damn Project.” It was supposed to be “dam project.” Any moments like that happen yet in Cyclocross Magazine? Yee: That’s pretty funny. Hopefully readers got a laugh about that one. There certainly have been a few more little errors than I’d like in our mag, but nothing quite that bad, knock on wood. Typos and spelling errors happen, but each one drives me nuts. I’m sure something like that will happen one day…but I hope not! I think you guys really made your mark with the U.S. National Cyclocross Championship coverage. That had to be the first ever play-by-play at Natz. What was the feedback like and what do you have planned for this year? Yee: Thanks man, that’s nice to hear. I feel a bit guilty because we single handily must have cost U.S. employers millions those four days in lost productivity! It was nice to have a great following and interested audience. I think it shows the real potential of ‘cross as a spectator sport, even if most of our followers were racers themselves. 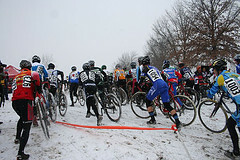 Cyclocross Magazine delivers live blow-by-blow coverage at U.S. Cyclcross Nationals. Sure, I’m biased, but it has so much potential as a spectator sport. I mean, I love mountain biking, but I have little interest in following blow-by-blow action of a mountain bike race. The rapid-fire lead changes and drama just typically aren’t there, let alone it’s difficult to see it all from one vantage point and report on it. But with ‘cross and its short races, it just lends itself so well for live coverage, and so when we did it at Nats and then Worlds, thanks in part to Raleigh and CyclocrossWorld’s support, it was really well received. It’s pretty cool to see “big media” taking notice of what we did last year, and eventually follow our lead, whether that was our initial live coverage via Twitter, or our adoption of the slick CoverItLive platform. This year, we’ve got some improvements planned…but we’re still working things out. We should have more events for sure, and hopefully some extra features. We’ll kick off live coverage at Star Crossed and then Cross Vegas, so stay tuned and get ready! Night races are awesome for live coverage since most of us won’t be out in the park racing ourselves. Will you be expanding your Worlds coverage or are you concentrating on the U.S. scene? Cyclocross Magazine on the ground at worlds. Pictured: Zdenek Stybar. Photo by Andrew Yee. Yee: I hope so! My wife and I cashed in our miles last year to get to Worlds and bring readers coverage, and we had our awesome photographer Joe Sales there as well as the invaluable help in reporting by Dan Seaton. It’s such an expensive trip when you factor everything in, but the U.S. is on the verge of bringing home that second rainbow jersey and I really want to support and cover our top riders as they race the best in the world. We had pretty good live coverage last year…even some of the other cycling sites were following it while at the venue in Hoogerheide! That’s pretty cool. Assuming we’re in Tabor, you can be sure we’ll step it up. I love that the publication is able to find a balance between the grassroots and the pro scene. I can read about Lars Boom and also learn to hack SRAM shifters for a single-chainring rig. As you grow, is keeping this balance becoming harder? Yee: It’s great you feel there is balance. Finding that mix is really my job. I can’t promise every article will appeal to every ‘crosser, but I hope a decent portion of the content will either inform or entertain all levels of racers or fans. So far it hasn’t been too hard because I myself am interested in all aspects of the sport, and we have a great diversity of contributors. Will the Bike Snob NYC continue to grace the pages of CXM with his presence now that he or she is a big-time Bicycling Magazine columnist? Yee: I certainly hope so. Bike Snob NYC is pretty busy and we don’t call very often but hopefully Bike Snob will continue to grace our pages and Web site with that great cyclocross wit. What was the best ‘cross tip you have learned or discovered? Yee: Beyond just having fun, there’s two that come to mind. Ride low air pressure and keep asking for advice, feedback and tips. The low pressure thing is something I somehow figured out really early in mountain biking, especially because it was a while before I could afford a suspension fork, but even I was surprised by our CXM Labs tests in Issue 3 when we attempted to quantify the benefits of low pressure. The “ask for feedback” part was something that was reinforced by our recent interview with Jeremy Powers. That made a lot of sense to me, it’s how you get better and is applicable way beyond ‘cross—we’ve always tried to follow that philosophy with the magazine too by always welcoming feedback. Since it’s largely by the ‘cross community, community input is invaluable. What can we look forward to in Issue 7? And when should we be on our door step waiting for the mail carrier to deliver it? Yee: Issue 7 has some neat stuff. Features on Niels Albert, Alison Dunlap, lots of brake-related content, a follow-up on our history piece, a look at our governing bodies, and a ton more. We know our mag never arrives soon enough. While I don’t pretend to understand the USPS variable, I’m working hard to make sure our magazine production is more streamlined. Much of that involves removing me as a bottleneck! I’d love to do more issues per year … if we keep growing and getting more subscribers, I think we can get there. Other than beating Neil from Road Magazine, what are your racing goals this season? Yee: Hah! Given my recent training, well, lack thereof, I doubt that will even happen. Like a lot of people, I dream of putting together that perfect race and getting that elusive win. I had a few good early races last year in Masters B but then everything quickly went downhill as I worked on the magazine more and sadly trained and slept a lot less. 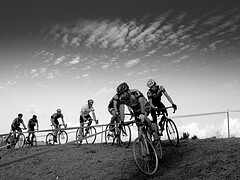 But really, having raced ‘cross for quite a while, and bikes most of my life, it’s really mostly a lifestyle for me. No major goals, just hope to improve a bit and have a bunch of fun and not get too injured. Any big race results or results you’re proud of? Any funny stories from racing? Yee: No, I have never really done much in racing. There are a few races I remember fondly. Once when I was like nine years old I raced against the big kids, like four years older than me. We had to do two laps of a crit course I was quickly off the back. But the main pack including my older sister somehow took a wrong turn. They were so far in front, another kid in front of me and I never saw them. So we stayed on course and I took second. My sister was the first to figure it out and turn around and she ended up third. So it was a good day for the family. Probably the other day of racing I remember well is my last day racing cyclocross in New England before moving out west. My friend Mark Abramson put on a race at his old high school, and knowing it was going to be my last race, I wanted to go out with a bang. So instead of just racing my usual Bs, I entered the C, B, and A race. I raced my singlespeed in the C race and got third, raced my geared bike in the Bs and finished mid-pack, and then lined up last for the As with the stretch goal of not being last. And it looked like I might have a chance to achieve that goal. Several times I was closing in on other racers, but Abramson and Matt Kraus were announcing the race and because it was my third race of the day, they were so badly heckling the two guys I was catching that both guys dropped out before I could overtake them! So, I was last that day, but with all the heckling and knowing it was my last race, it was a blast. Do you have a pit bike? Andrew Yee at the first ever Single Speed Cyclocross World Championships. Photo by Steve Ransom. Yee: As anyone can see on my Cowbell profile, I’ve got a bunch of bikes, almost all of them cyclocross. Many are Craigslist specials, but I feel fortunate to have been able to indulge in my passion and I could definitely bring a pit bike to a race. I don’t always bring one though—what I do sometimes is bring the singlespeed bike as a pit bike because sometimes I’ll do the double and bring up the rear in the singlespeed race. 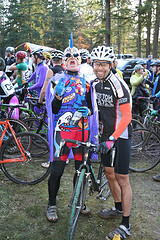 Once last year I flatted my ss bike in the singlespeed race, and grabbed my geared bike in order to finish the race. I tried to be true to the event and didn’t shift once, but it’s not like anyone cared—I was over a lap down after flatting. Yee: All three! I’m not doing my job unless I’m experimenting and testing equipment. You can’t beat the ride of tubulars, but I have to say, I’m a huge fan of tubeless in ‘cross. If you take the time to set them up right, they can provide 80% of the benefit of tubulars, with a few unique benefits as well. Any of your readers who are curious can check out the content we’ve published in our mag and on our Web site. For the home mechanic with some patience, tubeless can be a great setup. We’re now starting to see some cx bikes come stock with tubeless setups with the Redline’s Conquest Team. What’s your pre-race meal? Pre-CXM-deadline meal? Yee: [Laughs] Wow, we’re always asking racers that, but never thought I myself would be asked that. Around deadlines I spend way too many nights in a place open 24/7 called Happy Donuts, and so coffee, Red Bull, bagels and the occasional donut help fuel the completion of mag. For pre-race meals, lately, I’ve actually been skipping breakfast entirely. Sounds ridiculous but I’ve noticed having any empty stomach seems to help with this chronic problem I have. If you don’t mind me prying, what’s that? Yee: It’s complicated but I’ve suffered my entire racing life from this chronic side stitch. Many folks occasionally get it when exercising after eating. I just seem to get it all the time during intense activity. It forces me to race at 80-90% in order to avoid debilitating pain during a race—pain that can linger for as long as week. I’ve asked every doctor I know, and never found a solution, but the leading theory is that these tiny ligaments that hold my liver in place start to spasm during intense breathing. So maybe I have either weak ligaments or a heavy liver or both. I’ve always said that if I had a million bucks, I’d give it to the first person that solves that problem. Uhhh, after saying that out loud, that sure sounds selfish and unimportant. Okay, after using it to solve world hunger, world peace, and global warming, I’d use the remainder to solve this super-frustrating problem. When you’ve raced your entire life and have never felt like you’ve ever been able to give it 100%, it becomes more than a trivial issue. Maybe that’s our next contest? Solve Andrew’s side-stitch problem? Yee: I just want to thank the many folks who contributed to this effort or supported the mag … it’s been awesome, and I’m super grateful as it’s been a collective effort. If folks respect what we’re putting out and doing for the sport, I’d love it if they keep spreading the word. And if anyone passionate about ‘cross wants to get involved by contributing content or helping out, definitely drop us a line! Thank a bunch. See you at the races!